The Coca-Cola Company, c 1900, via Wikimedia Commons. The first of the types of figurative expressions that I want to consider is the one which is often deemed the greatest, and is certainly the most widely-invoked by those writing about paintings: metaphor. Visual metaphor is relatively common in advertising, as shown in the old Coca-Cola advert above. 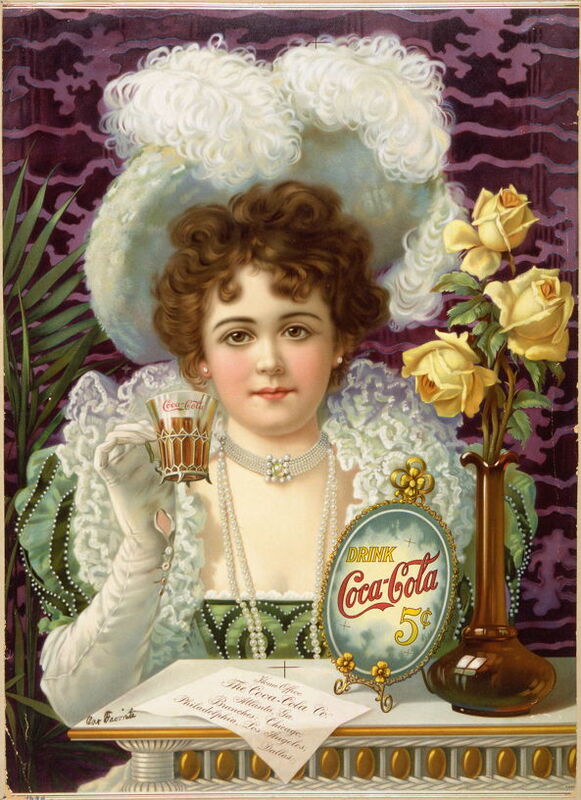 Many such images succeed in bringing together two apparently unrelated subjects, here of chic opulence and the drink in question, using the one to position the product favourably in the mind of the beholder. In this particular case (as is common) the name of the product is also given verbally, to dispel any doubt about the association. There is an excellent and amusing collection on the Visual Metaphor pages here. In language, a metaphor is a figurative expression (trope) in which there is an implicit comparison between quite different things or concepts, where common properties are implied as being equal. The most powerful metaphors actually use the two things or concepts to generate a third. One of the best-known verbal examples is Shakespeare’s “all the world’s a stage”. Simile can be considered to be a special restricted case of metaphor, in which the comparison is made totally explicit, with a comparator such as ‘like’ or ‘as’ to distance and weaken it: ‘he is as strong as an ox’, which is narrower in the transfer of properties from the ox to the man than the metaphor ‘he is an ox’, which could also imply that he is the size of an ox, and possibly has the temperament and brain of one too. Metaphors (and similes) require two parts, the thing or concept in question, often termed the ‘tenor’, viewed in semiotics as a signifier, and the thing or concept which modifies that, termed the ‘vehicle’, in semiotics possessing the signified qualities which are transferred. Linguistically metaphors must contain both parts: if Shakespeare had written ‘all the world’ or ‘a stage’ it would have been neither metaphorical nor any sense. When only the ‘vehicle’ is given, and the ‘tenor’ is implicit and supplied by the reader, this is known as metonymy or a synecdoche, or a symbol, and of course providing the ‘tenor’ alone is literal and non-figurative. Symbols in particular are quite limited in their possibilities, as both the writer and the reader need to share the symbolic lexicon, or the symbolism will fail. I will develop the concepts of metonymy and synecdoche in later articles, but for the moment it is perhaps helpful to understand that a symbol is an object which represents a (dissimilar) object or concept, by way of a token or sign. Verbally, a simple example is the term ‘blues’ for depression. Metaphor is also distinct from allegory, which is the treatment of one subject under the guise of another by means of symbolic narrative, as in George Orwell’s book Animal Farm, for instance. I hope that the above is clear and uncontroversial, but fear that the remainer of this article may be less widely accepted. Generalising from verbal to visual metaphor, various definitions have been given, including the following used by Susan Ryland here: metaphor is defined as understanding one conceptual domain in terms of another conceptual domain. A conceptual domain is any coherent organization of experience. However both parts of the metaphor, both conceptual domains, need to be shown in some way in the painting (or photograph, etc. ), just as they are in the Coca-Cola advert. If that painting had only shown the young woman and not the product, the metaphor would have been broken. If it had only shown the product and not the young woman, again the metaphor would not have existed. It takes two to metaphor. Over the last few days, I have been racking my brain to try to recall one significant painting (other than an advert) in which both parts of a metaphor appear, but I have still not been able to recall or discover one. I invite suggestions, please. There is another limitation with verbal metaphor, that in general you have to be very careful when trying to use more than one metaphor at a time. If you do use two or more, the danger is that they will become mixed, and then, as you might say, the cows may come home to roost. This would be even more of a problem in a painting, which lacks the serial structure of written or spoken language, and would readily permit mis-association of the parts of multiple metaphors. Many of those who have taken to offering us ‘readings’ of paintings have used the term metaphor quite extensively, although in few cases does their use conform to the above. 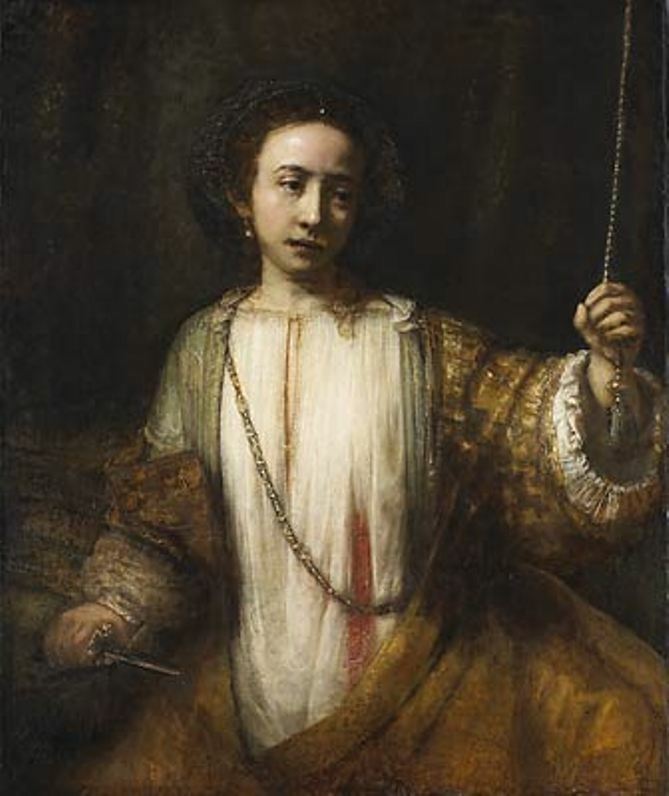 On page 238, Bal stresses the importance of the letter in Rembrandt’s Bathsheba (1654) “as a metaphor, or allegory, of literality”, which statement is in turn a paradox. As the letter in the painting does not have any discernible text on it, and is held almost entirely with the written side facing towards Bathsheba’s leg and away from the viewer, this again fails to meet the critera for metaphor. Many, if not most, of Bal’s uses of the term appear similar. Paul Cézanne, “Le Bassin du Jas de Bouffan en Hiver”, 1878 (R350), oil on canvas, 47 x 56.2 cm. private collection. WikiArt. 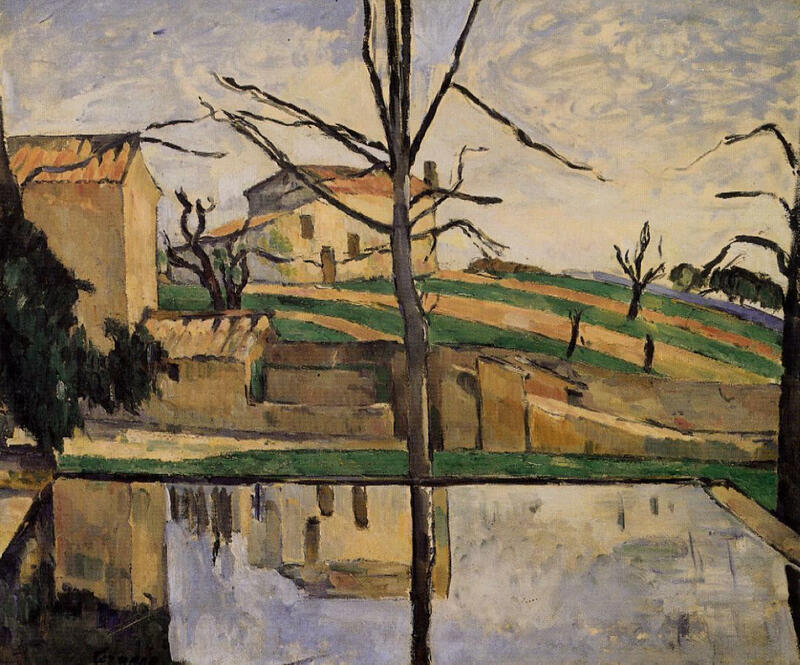 As what is shown in the reflections in this work bears resemblance to neither what should have been seen there, nor anything relating to Cézanne’s own work, nor the verbal metaphor used by Coutagne, this too fails to meet the criteria for metaphor. Similar examples can be found in the great majority of books which attempt to provide readings of paintings. To their great credit, neither Linda Nochlin (writing on Courbet) nor Simon Schama (on Rembrandt) find it necessary to misuse the term metaphor, and Grootenboer’s rhetorical analysis of still life painting in the Netherlands is exemplary in referring throughout to signs, symbols, and allegories. If this seems unreasonably strict, consider how you might express Shakespeare’s verbal metaphor in an image. Depict either of the two components without the other, and the metaphor does not exist, nor can the viewer be expected to complete the metaphor. Only when you have, say, projected a stage across the face of a globe does your image express the whole metaphor, and assume its meaning. Unless you redefine metaphor to encompass what is currently meant by symbol and allegory, visual metaphor in painting requires both the components of the metaphor to be shown in the painting, something which happens relatively rarely. The great majority of instances in which commentators have referred to metaphor in painting are actually symbols, allegory, metonymy, or synecdoche. I will therefore examine them next. Coutagne D (2006) in Conisbee P and Coutagne D, eds., Cézanne in Provence, Yale UP. Grootenboer H (2005) The Rhetoric of Perspective. Realism and Illusionism in Seventeenth-Century Dutch Still-Life Painting, Chicago UP. ISBN 978 0 226 30970 5. Nochlin L (2007) Courbet, Thames & Hudson. ISBN 978 0 500 28676 0. Posted in Language, Painting and tagged allegory, language, metaphor, painting, rhetoric, symbol, trope. Bookmark the permalink.